PageTable is a pretty critical piece of Voron. It is the component responsible for remapping modified pages in transactions and is the reason why we support MVCC and can avoid taking locks for the most part. It has been an incredibly stable part of our software, rarely changing and pretty much the same as it was when it was initially written in 2013. It has been the subject for multiple performance reviews in that time, but acceptable levels of performance from our code in 2013 is no longer acceptable today. PageTable came up recently in one of our performance reviews as a problematic component. It was responsible for too much CPU and far too many allocations. Here is the sample workout for this class, which just simulates ten thousand transactions. This little scenario takes 15.3 seconds and allocates a total of 1.1GB of memory! That is a lot of allocations, and must have tremendous amount of time spent in GC. 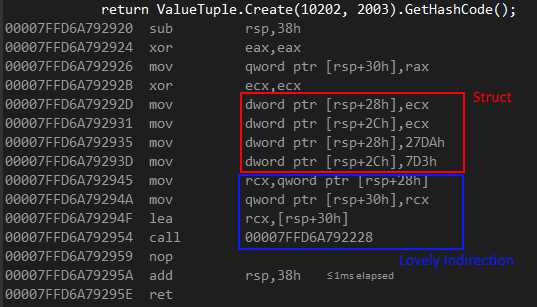 The most problematic issue here is the SetItems methods, which will allocate two different delegates for each modified page in the transaction. Then we have the total abandon in which we’ll allocate additional memory in there. As you can imagine, we weren’t very happy about this, so we set out to fix this issue. We can take advantage off the fact that SetItems and RemoveBefore are only called under lock, while TryGetValue is called concurrently with everything else. This relies on allowing stale reads from concurrent readers, which we don’t care about since they wouldn’t be able to make use of the data anyway, and it was able to reduce the allocations to just 320 MB, but the runtime actually went up to 32 seconds. That is quite annoying, as you can imagine, and much cursing enthused as a result. I then pulled my trusty profiler ask it kindly to figure out what piece of code needs to be hit with a rolling pin and have a stern talk to about what is expected from code after it has been laboriously and carefully optimized. It is expected to sit nicely and be fast, or by Git I’ll revert you. What the hell?! Here are the original implementation costs, and you can clearly see how much time we are spending on garbage collection. And here is the optimized version, which is actually slower, and actually used more memory?! So we are 3.4 times higher, and somehow, the cost of calling the concurrent dictionary TryGetValue has risen by 88%. But the implementation is pretty much the same, and there isn’t anything else that looks like it can cause that much of a performance gap. I’ll leave this riddle for now, because it drove me crazy for two whole days and give you the details on what is going on in the next post. I have to go over a fairly compress pull request, adding a pretty big feature. 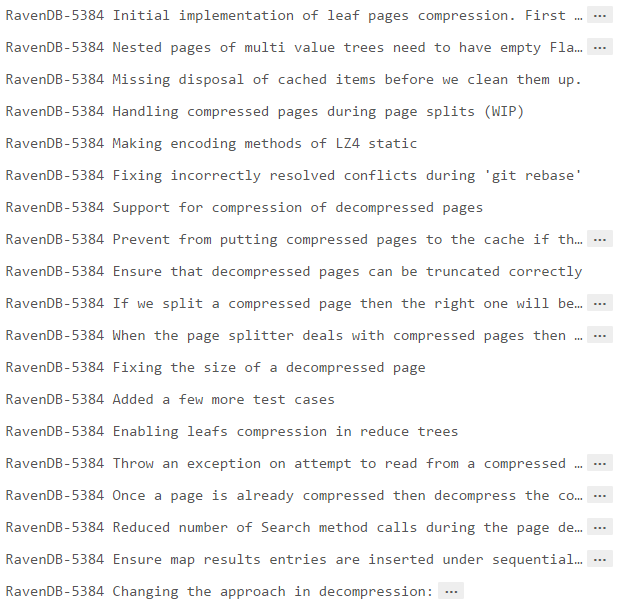 The feature, if you care, is compressing data in the leaf pages of a B+Tree for use in Map/Reduce entries storage. The current and non final results are reducing storage costs from about 650MB to 32MB, so we are pretty happy with it, but this isn’t the topic of this post. There are over 30 commits over a period of three weeks there, and they represent a lot of experimentation as we go along. This is fine & proper as far as we are concerned, since we this represent quite a bit of work, and we certainly want to be able to track it. But since this isn’t completed, the commit history is long, which means that reviewing it one commit at a time is not trivial. In particular, there are a lot of back and forth changes in the same place, and I don’t want to review code that has been changed. Luckily, git make it easy to change that view. I pull the changes to my local branch, then reset the log to the last commit before the merge, then I just squashed all those commit into a single one. You can check it out here. Which is much nicer way to go about reviewing this, since I can look at all the changes in one shot, and more to the point, I can make comments on the changes using our normal workflow. My Talk at InfoQ Brazil has been published. Note: This post was written by Federico. Let me illustrate with some examples. ValueTuple is a new type that is being introduced that is necessary for some of the new tuples functionality in C# 7. 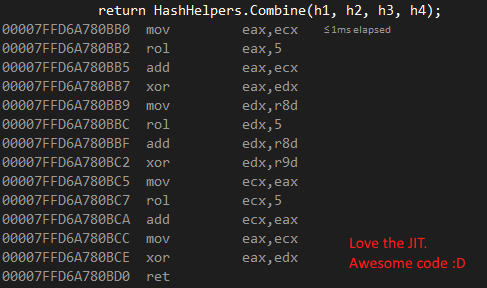 Because hashing is important, of course they implemented the ability to combine hashes. 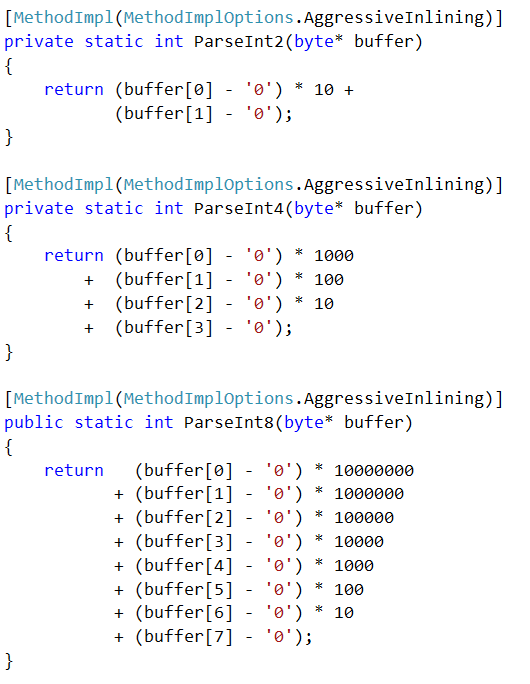 Now, let’s suppose that we take the actual code hashing code that is being used for ValueTuple and use constants to call it. 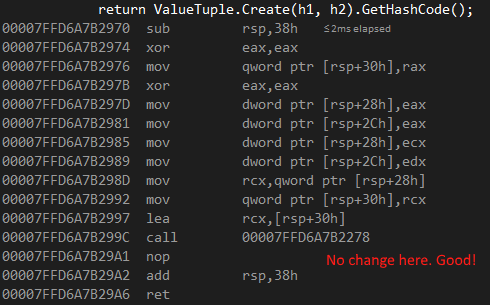 Now under an optimizing compiler chances are that there shouldn't be any difference, but in reality there is. So now what can be seen here? First we are creating an struct in the stack, then we are calling the actual hash code. I know!!! How cool is that??? We use random values here to force the JIT to treat them as parameters and not being able to eliminate the code and convert it yet again into a constant. I really wanted to leave this series of posts alone. Getting 135 times faster should be fast enough for everyone, just like 640KB was. Forcing the inlining of those methods also helped, and pushed us further toward 240 ms.
Another cost that we had was date diff calculation, we optimized for the case where the day is the same, but in our dataset, we have about 2 million records that cross the day line. So we further optimized for the scenario where the year & month are the same, and just the day is different. That pushed us further toward 220 ms.
At this point the profiler was basically laughing at us, and we had no real avenues to move forward, so I made the code use 4 threads, each processing the file at different locations. 527 times faster than the original version. Allocate 1350 times less memory. 1/3 of the working set. Able to process 3.7 GB / sec. Note that at this point, we are relying on this being in the file system cache, because if I was reading it from disk, I wouldn’t be able to do more than 100 – 200 MB / sec. Here is the full code, write code like this at your peril. Okay, at this point we are really pushing it, but I do wonder if we can get it faster still? 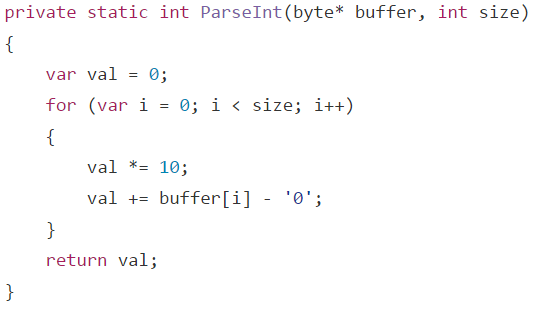 So we spend a lot of time in the ParseTime call, parsing two dates and then subtracting them. I wonder if we really need to do that? So we are now 135 times faster than the original version. And at this point, I think that we are pretty much completely done. We can parse a line in under 75 nanoseconds, and we can process about 1 GB a second on this machine ( my year old plus laptop ). We can see that the skipping the date compare for time compare if we can pay off in about 65% of the cases, so that is probably a nice boost right there. But I really can’t think of anything else that we can do here that can improve matters in any meaningful way. So yes, that is 135 times faster, but the first version took about 10 minutes to write, then another half an hour to fiddle with it to make it non obviously inefficient. The final version took several days of careful though, analysis of the data and careful optimizations. Are you kidding me?! Here I am worrying about every little bit and byte to try to get the most performance out of the system, and Dictionary is eating almost 50% of my performance? So that is about 3 μs, which is pretty fast. But it isn’t fast enough. Now, know that there are about 200,000 unique values in the dictionary (look at the Insert calls in the profiler output), and we have some knowledge about the problem space. The id that we use has 8 characters, so at most, we can have a hundred million ids. An array of that size would be roughly 762 MB in size, so that is doable. But we also can be fairly certain that the ids are generated in some sequential manner, so there is a strong likelihood that we don’t need all of this space. Changed the stats to start with an array of 256 longs, and run it, the results are nice. This is single threaded, of course, and it is faster than all the previous multi threaded versions we had before. After looking at the profiler results, I realized that we are actually spending a considerable amount of time just writing the output to a file. That didn’t really matter when our code run in 30+ seconds, spending another 100 – 200 ms to write the results was just noise, but when our code is doing that in under a second, that a considerable cost. So we are 45 times faster than the initial version. Merely 25 times faster than the original version. And now let us focus on the output. This is pretty simple code, but it hides a lot of inefficiencies, in particular, it is doing a lot of allocations as it format the string. We can do much better. I wrote a simple function to format the number into a buffer, then change the summary line to write a single line into a prepared buffer (and skip all the static stuff), and write the to the file file in one shot. You might have noticed that I have two copies of the WriteFormattedInt, this is to skip the implicit cast to long, and yes, it matters, by about 50 ms in my tests. But this version also reduces the number of allocations we have by over 100 MB! So this is great. This function is now almost 7 times faster! That is pretty awesome, and even talking about single threaded performance, we are looking at 32 times better than the original version. And a total improvement of 52 times! But we can do even more… I’ll talk about it in the next post. After doing all I can without reaching out to the profiler, and managing to get x45 performance gain, let us see what the profiler actually tells us. We’ll use the single threaded version, since that is easier. We can see that dictionary operations take a lot of time, which is to be expected. But what is very surprising is that the date time calls are extremely expensive in this case. The relevant code for those is here. You can see that it is pretty nice, but there are a bunch of things there that are likely costing us. The exception inside the method prevents in lining, there is error handling here that we don’t need, since we can safely assume in this exercise that the data is valid, etc. And that saved us 11%, just this tiny change. Note that we reduced the cost of parse significantly ( at the cost of error handling, though ), but there are still a lot of work being done here. It turns out that we were actually measuring the time to write to the summary file as well (that is what all those FormatHelpers calls are), so that dirty the results somewhat, but nevermind. The next place that we need to look at is the Dictionary, it is expensive, even though the usage of FastRecord means that we only need a single call per line, that isn’t so much fun. Note that it is using the GenericEqualityComparer, can we do better? Trying to create my own equality comparer for longs doesn't really help. So we’ll go back to the parallel version with the ParseTime optimization, and we are now running at 628 ms. And at this rate, I don’t think that there is a lot more room for improvements, so unless someone suggests something, we are done. After introducing the problem and doing some very obvious things, then doing some pretty non obvious things and even writing our own I/O routines we ended up with an implementation that is 17 times faster than the original one. This is pretty much the same as before, but now we are dealing with pointers. How do we use this? We memory map the file, and then we go over it, doing no allocations at all throughout. This give us 1 second to process the file, 126 MB allocated (probably in the dictionary) and a peak working set of 320 MB. This is pretty ugly, but basically we are using 4 threads to run it, and we are giving each one of them a range of the file, as well as their own dedicated records dictionary. After we are done, we need to merge the records to a single dictionary, and that is it. Using this approach, we can get down to 663 ms run time, 184 MB of allocations and 364 MB peak working set. So we are now about 45(!) times faster than the original version. We are almost done, but on my next post, I’m going to go ahead and pull the profiler and see if we can squeeze anything else out of it.